You’ve made it this far and we are so proud of you for not letting anything stop you! Now on to fitting yourself for a bra made just for your journey. To find your perfect bra size, watch the fitting video and follow the steps below. Find a fabric measuring tape (don’t have one?) and a good friend to help. While wearing a well-fitting, unpadded, non-sports-style bra, take two measurements. One should be at the bust and one at the underbust. Make sure the tape lies flat on your body and is parallel to the floor. Write these numbers down. Repeat the process and if the measurements are not identical, do it a third time and take the average of the numbers. Round the final numbers to the closest full inch. Example 1: If you measure your bust at 35-3/4″, 35-1/2″ and 35-3/4″, your average is 107″/3 = 35.67″. Since that number is closer to 36″ than to 35″, round that up to the next full inch measure, or 36″. Example 2: If your average underbust measurement is 34-1/8″, that is closer to 34″ than to 35″ so you would round down to 34″. 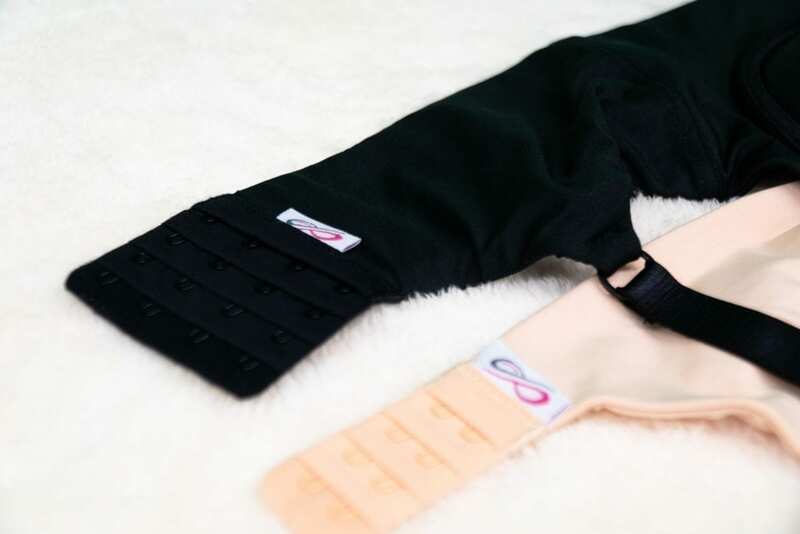 At Elemental, we heard from our thrivers that a tight band was rarely desirable and most women tended to choose a bra band that was one size larger than traditional bra sizing would recommend. We designed our underbands to be a bit on the generous side. If you find your measurements are right between sizes, consider whether you prefer a looser band (choose the larger number) or a more snug-fitting band (choose the smaller number) and choose accordingly. Referencing the chart, locate your underbust measurement along the top row and your bust measurement along the left side. If your underbust measurement is less than 30 inches, use the 30 column. Where the row and the column intersect is the bra size we recommend for you. Note that bras are currently available only in the sizes denoted by the green shaded areas. If your bra size falls in one of the pink cells, we recommend that you select the sister size that is in the green cell immediately left or right of the pink cell and denoted by a bold outline. We hope to be able to add a broader range of sizes with future orders so please send us a note to let us know what size you would need and we’ll know what sizes we should add. Still looking for answers? Check out our available sizes and sister size information below! Of course women come in all shapes and sizes but to begin with we had to choose what sizes to produce. We asked for feedback and the following sizes met most individuals needs and will be offered for the first round of production. If your measurement suggests that you wear a size that is not currently available in our bras at this time, you may be able to wear the sister size. 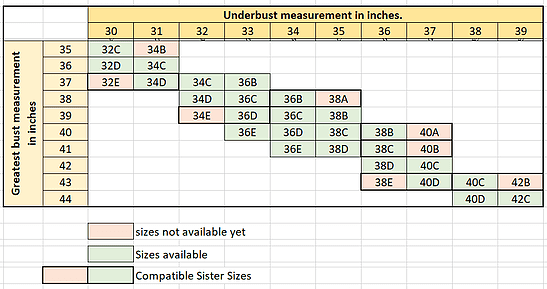 To find a sister size bra for you, locate your size on the chart and look for a green box to the left/right. This highlighted size is your sister size. The band is a little larger and the cup is bit smaller, but most often the sister size fits comfortably, too. We have designed our bras with one additional row of hooks and eyes to allow for more adjustability in the circumference of the band. One size larger band should allow you to fill the cup and still cinch the band to the correct circumference for your comfort. Example: My measurements suggest that I should buy a 34C. I generally like my band a bit looser so I buy my sister size; a 36B. Found Your Perfect Fit? Time To Shop! No problem! Finding your perfect bra size can be a little tricky, so we’re here to give you extra support. Just fill in the form and a bra fitting specialist will get back with you within 24 hours. There are a few options you can do if you don't have a fabric measuring tape available. Use a piece of string to wrap around yourself. Make a mark on the string where it meets or hold your fingers on it. Then lay a regular tape measure on the table to measure the length to the mark you made. Follow the rest of the instructions as noted to get your perfect size! Print out a downloadable measuring tape. Cut the strips of the measuring tape and tape it together accordingly. Then use as a regular measuring tape! Find a printable measuring tape here.